When it comes to baby’s room design, it’s 100% predetermined by the taste of parents or a designer they hire. But a room for a primary school age girl is a completely different story. Firstly, such a kid’s room should please and inspire its little hostess. Secondly, it should be equally fit for night rest, games and studies. Moreover, such zoning should be based on the principle of ultimate rationality, rather than on the “who-cares-as-long-as-all-the-zones-are-fit” principle, which means that a kid should equally enjoy studying here, the room should be comfortable for playing and nothing would disturb a girl from having nice dreams. We have decided to show you all the must-haves of a primary school age girl’s room in context. So, let’s begin! The room with the total area of 17 square meters includes 4 full-fledged functional zones: a sleeping area along one of the walls, a storage system by the other wall, a study area by one window and a comfy ceiling swing chair with bookshelves by the other. 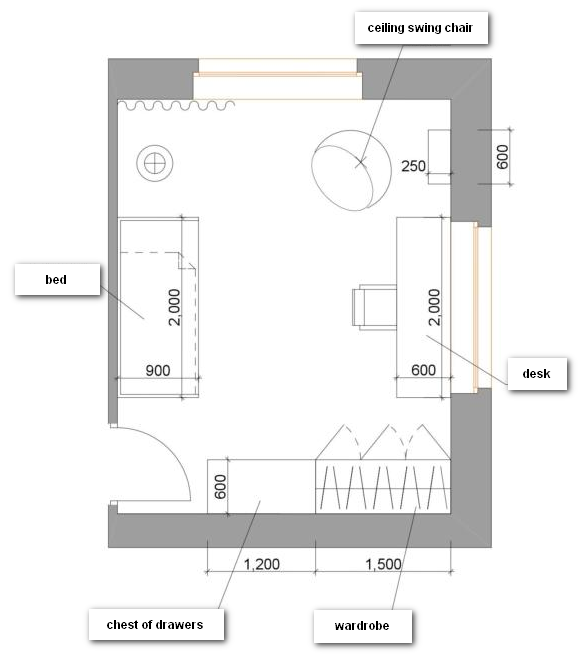 Lighting scenarios are also carefully considered: there is a main light source (a ceiling lamp) in the middle of the room, a floor lamp in the corner, a desk lamp in the work area and a couple of sconces above the head of the bed. One of the basic principles that must guide the choice of materials for a kid’s room is their safety, so no penny pinching to be done there. Give preference to exclusively reliable, durable, eco-friendly and hypoallergenic materials: wood, parquet or cork for the floor, eco-safe paint or cellulose-based wallpaper as wall coverings, wood, MDF or E1 chipboard for furnishing, and finally linen, cotton and wool for home textile. Pink is the most popular choice for decorating a little girl’s room, but when the hostess of the room is already attending school such an excessively literal color solution may appear to be too infantile and childish. If pink is what makes your daughter tick, use it in accents against a pastel and “soft” light background. When choosing wallpaper, pay special attention to patterns: an active large pattern used on all the four walls may really disrupt your daughter’s ability to concentrate on studying or reading. If you’re not happy with totally monochrome walls, choose an accent wall and cover it with some bright wallpaper with an active pattern, while finishes of other walls should be made more reserved and neutral. That’s exactly the kind of thing that was made in this very room: the wall in the relaxation zone was covered with bright flamingo wallpaper, while the others were coated with monochrome paint of two similar hues. The role of an interior accent is also played by yellow details: the chair and a set of bed linen. Their activity is, in turn, compensated by the white color of the furniture and a light shade of the floor covering. The most important thing about decorating a kid’s room is the sense of proportion and moderation: in an effort to make a girl’s bedroom beautiful and comfortable there’s a huge risk you turn it into a Barbie’s house copy. Get a couple of wall pictures, a few sweet throw pillows and a beautiful stationery set. This would be quite enough, since the hostess of the room will apparently add many little sweet things of her own: posters, photos, stuffed animals and etc. One more detail that deserves a special mention is the moldings: they’re perfect for any interior style, very helpful in visual correction of room proportions and very useful in the role of interesting, yet unobtrusive decorative elements. So that the moldings didn’t look too “official” in a kid’s room interior, they can be painted some bright color. In our example the designer chose saturated yellow hue for ceiling moldings, which is also the accent color of the furniture and textile.